After the misadventures in Chhatri, I settled down in Janjehli for a few days. I liked the feel of the place with all its inexpensive homestays set amidst apple orchards. Travelshoebum left due to some urgencies and I was back to solo trekking again. The primary intention, of course, was to trek to the shrine of Shikari Devi. However, before that, let me just post a few pics of Janjehli. The town itself has a few old wooden temples. There is also an ancient rock called Pandav Sheela as the local myths connect it to the Mahabharata era. Coming back to Shikari Devi, it is another one of those treks that I had been in my mind for many years. I once thought of doing it from Karsog and once after the Kamru Nag trek but never worked out but now the time had arrived. Janjehli to Shikari Devi has a 16 KM long motorable road although there exist no direct buses. One can hire cars for INR 1000 but as the readers of this blog would know, I can survive for 3 days on the road with that kind of money. The possibility of getting a lift was always there but I prepared myself mentally for a very long and tiresome walk and set out early morning. The initial part of the walk was brisk and painless. I did see many other cars passing by and some of them could have given me a ride by I was enjoying the walk through the cedar-lined stretch and so kept walking. After a couple of hours, I reached a point with a couple of small roadside shops. It was still 6 KMs away and the road was gaining a bit of elevation and I was beginning to see those famed serpentine turns I had seen earlier in many photographs. I soon realized that this area is part of a wildlife sanctuary although I could see no wildlife. I even noticed some very steep trek routes through the jungles that probably were shortcuts to my destination. By after having walked for more than 10 KMs already, I had no appetite left for those and preferred to continue along the longer path with gradual elevation. Apparently, there is another shrine called Budha-Kedar out there on that trail but I decided to skip that one. After a couple more hours I finally saw a thick concentration of huts that are generally found in any kind of religious spot in India. Even from a distance, I could tell that some of them will be restaurants and some others selling essential stuff to the devotees. I thought my ordeal had ended after almost four and a half hours of incessant walking and hiking. However, as I reached those shops, I found no temple but an almost vertical flight of stairs going upwards and disappearing into the sky. It was almost like running a marathon and then finding out that you also have to complete a 3000-meter steeplechase to be accepted by the society. Nevertheless, I paused for a while, had a glass of tea in one of those shacks, and started dragging myself upwards. Most other people there had arrived on other some vehicles and only climbing these stairs with fresh legs. It took me almost half an hour to complete those stairs. The end of the stairs also marks the end of treeline and suddenly I found myself in an open, green plateau, with the famed shrine of Shikari Devi at its highest point. There were some other houses at lower levels, mostly places where pilgrims can take shelter. I bypassed them quickly and directly moved on to the temple. So, the temple of Shikari Devi is unique because it has no roof. The goddess sits under the open skies although there are walls on all sides. As the name suggests, she is a hunter goddess, akin to Artemis or Diana. Probably that is what explains the lack of roofs. She lives in perfect harmony with nature and the sky becomes her roof. I am not sure how exactly this shrine came to be here but the statues carved out of stone seem to be like other Devi statues that can be found elsewhere in such hilly shrines. Shikari Devi is surely a local embodiment of one of the mainstream goddesses of the Hindu Pantheon, such as Kali and Durga as the iconography on the walls showed. While the walls seemed to have been freshly painted, the stone statues surely looked ancient. I took some time to soak in the atmosphere. The sun was getting covered by clouds repeatedly for brief periods. A chilly wind was blowing at around 3300 meters and the cloud covered moments were bitterly cold. I had a brief chat with the priest. The priest told me that during winter even he has to leave the place and come down. The entire place gets buried in the snow but the main statues of the deity remain above the snow. From the top, one can have a good 360-degree view of the green meadows leading up to the treeline below. I could also see the beautiful forest resthouse with the most exotic location possible. With a bit of better planning, I could have stayed here too! After spending around an hour at the top, I was planning to come back but then I got into a chat with a local person who liked the fact that I took the trouble to walk this far like his ancestors. Nowadays most people just drive up to the stairs. He also suggested that since I had come that far, I must eat. That is only when I realized that there is a kitchen behind the shrine and they serve free food to the devotees. I got a plate of khichdi and a generous dose of mango pickle that reminded me of Hemkund. As they say, the best things in the world are free. That never seems true in this 21st-century world but yes, there are places where you can genuinely experience the same. Just to add to the same feeling, one guy also offered me a lift while returning later that evening. By that time I had covered around 8 KMs already and beginning to get tired again but the rest of it was taken care of quickly. How to reach Shikari Devi? You can reach Shikari Devi either from the towns of Karsog or Janjehli, both reasonably big towns with hotels, homestays, and ATMs. You can hike the whole way or hire a car or hope to get a lift. Janjehli is directly connected to Mandi via HRTC buses (Even Shimla bound buses go via Mandi although there exists a shorter route). Karsog is directly connected with both Shimla and Mandi. There is also a direct trek route from Kamru Nag to Shikari Devi shrine through thick forests. But it is not advisable without local guides. 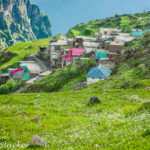 Where to stay in Shikari Devi? Apart from Karsog and Janjehli, you can stay at the iconic Forest Rest House near Shikari Devi and also there are some very cheap accommodations near the temple meant for pilgrims. There is also an HPTDC Trekker’s Hostel near Janjehli en route to Shikari. Can one visit Shikari Devi in winter? Yes, it can also be a snow trek. But be careful. No one stays up there during winter and it can be difficult as well as dangerous. Unfortunate incidents can happen during winters. Whoa! That is some incredible trek. I may have given up half way through the trek. Those stone idols do look ancient. Thanks for showing them. The name Shikari Devi made me click the blog. It is an interesting name. Quite a pristine place I must day. I am more well acquainted with the mountains of Western Ghat (Sahyadris). Your blog is a good resource for information on treks in Uttarakhand and Himachal, two states I need to explore more. Wow, I am impressed you completed this trek. What a lovely journey of things to see. And a wonderful temple as your reward at the end of all those stairs! What a beautiful small village Janjehli is. I love all the hill country photos you’ve put here. Amazing that you completed the trek and you got free food so yay to that! Here in Sri Lanka also the devotees get temple food free which is amazing. To be honest, the name ‘ Shikari Devi Trek’ was alien to me, but am glad I clicked through. India is a country with a lot of small hidden wonders, and you seem to be putting it out to the world in wonderfully described words and the lovely photographs..
Wow, 16km and more than 4 hours was a very long walk! I certainly wouldn’t be able to do that. It seems like you had a very long but rewarding journey – unique temple, unbelievable views. What an interesting article. I love your Himalayan stories and the offbeat stuff you share. I love the old wooden temples of Himalayas. And I am so glad you found few here as well. the name of the place sounds so intriguing. I hope Travedlshoebum is all ok! Oh wow – good on you for not taking any shortcuts! That hike looks well worth the effort though, beautiful temple. A long but rewarding adventure for sure! I would have died trying to get through all those stairs! Wow. Never was I aware of this amazing place. Incredibly long trek…whoa! Hats off to you for this and this stunning picture of (probably) the forest rest house. …the green meadows and shades of green are brilliant in this pic.